"Twain was a somewhat racist white boy (he belonged to Confederate militias in the early days of the looming conflict) who was changed for the better by his own writing—another phenomenon that many writers have shared, growing into their own best selves. Twain grew up among African-Americans, mostly slaves, and he learned to love them, but Native Americans were another story—a story he actually began, called “Huck Finn and Tom Sawyer Among the Indians.” Very early in his narrative, the savages reveal their irredeemably vicious nature by massacring everybody in sight, and, soon after that, probably because it had in effect dead-ended, Twain abandoned the story. I decided to take up his notion of Huck and Tom heading West just before the American Civil War, seeing the horror of the time through Huck’s eyes, while retaining the feel of “A Boy’s Adventure Story." To prepare for this book, I took the time to reread Twain's Tom Sawyer and Huckleberry Finn, and I was amazed how different both books became after reading it as an adult. One huge thing I missed as a kid reading this novel, something which has great bearing on Huck Out West, is that while Huck and Jim are making their way on their raft down the Mississippi, they find that they share a desire for freedom -- Huck is escaping from not only his abusive Pap but also from what he sees as entrapment by civilized society, while Jim is seeking to find and buy freedom for his family who are slaves. It's during this journey that the two bond, Huck ultimately coming around to see Jim as the human being he is. "nigh to cricks too fast and shallow for rafting, but prime for fishing -- there was even a patch of sweetly clovered meadow beside the crick for Tongo to graze on -- I knowed I was at home." "there warn't no town, just the Gulch, not no saloons nor churches nor women, nor not no gold, nothing to trouble the peace, only a few hairy old bachelors..."
-- but he finds his peace shattered by the influx of emigrants who begin to flood into the area as word gets out about gold in the Black Hills. Soon the place is swarming with missionaries, prospectors, opportunists, deserters, drifters, and others who are there to claim their own piece of the American pie in any way they can, and who view the Lakota as "savages ... ain't even completely human," including his old friend Tom Sawyer, who shows up on the scene. 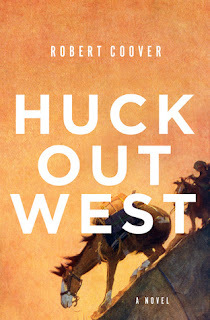 Huck knows what's coming, having seen it before while working as a horse wrangler for the General, and along with Eeteh, just wants to get away from "all this sivilizing" as he had tried to do so many years before. But his hand is forced when he must make a choice between his past and his future. Where there are some genuinely funny moments in this novel, the story told here by Huck is quite frankly, horrific. As Mr. Coover notes in the New Yorker interview mentioned earlier, it's "Not a pretty history:"
"The story starts at the outbreak of the Civil War and ends with the Deadwood Gold Rush. This era, not the Revolutionary period, was what truly made us who we are. It was an adventurous time, but also one full of greed, virulent hatreds, religious insanity, the slaughter of war and its aftermath, widespread poverty and ignorance, ruthless military and civilian leadership, and huge disparities of wealth." There is much, much more to this book (the power of storytelling and myth, what it actually means to grow up, etc.,) but what struck me the most about it was reinforced later by something I heard after finishing the novel in an online interview on WNYC (which you absolutely shouldn't listen to until after you've finished the book). It's all to do with the bonds between Eeteh and Huck that transcend their differences, and the image of the two living the "possibilities of human-to-human peace and reconciliation," just as Jim and Huck managed to do a long time ago while floating down the big river. What a lovely thought, especially right now. I didn't read this book as just a modern sequel or to spend time comparing it to Twain's original work. I don't think that's the point and frankly, it's just a big waste to approach this novel that way. Despite the horrors of the reality found here, it's a gorgeous book and one that needs reading right now. I think if I read a book about Mark Twain's racism towards African Americans or Indigenous people at this point when we're dealing with such horrid people in Washington that I'll faint. What I'll remember is his well-written King Leopold's Soliloquy about Belgian colonialism in the Congo. That was a good essay.